Jeannette and Harry Ayer moved to Mille Lacs in 1918, established a roadside trading post, and launched a fishing resort complete with cabins, a boatworks, a restaurant, and guided fishing expeditions on the lake. By the late 1950s, the museum that the Ayers had begun in the back room of the store to display their personal collection of Indian-made objects had expanded into its own cinder-block building next door. In 1959, the Ayers retired and donated the collection, buildings and land to the Minnesota Historical Society. In August 1960, the state opened an exhibit of artifacts to the public. Four years later, work began on the Four Seasons Room, which opened in 1969. The room houses a life-sized diorama of typical Ojibwe activities as they would have been in the mid 1700s. Actual band members were later cast as mannequins and added to the exhibit. Carrying culture through education and language. Providing continuity through the evolution of traditional practices. Using kinship attachments as a defensive strategy. Defining community identity through a shared history of resistance. Surviving through adaptation and flexibility. Mille Lacs Indian Museum, 1983. 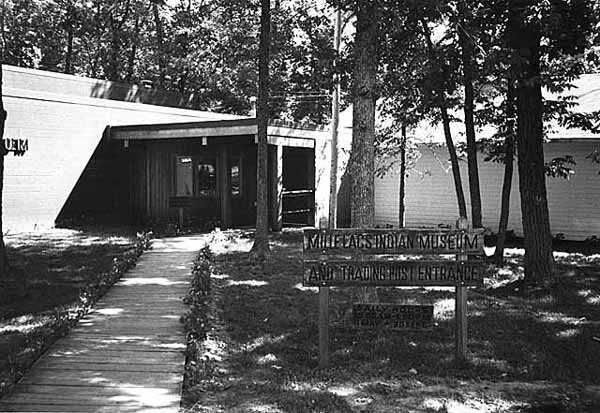 Mille Lacs Indian Museum, 1983. Source: MNHS Collections. In 1996, the new museum and restored trading post opened to the public. 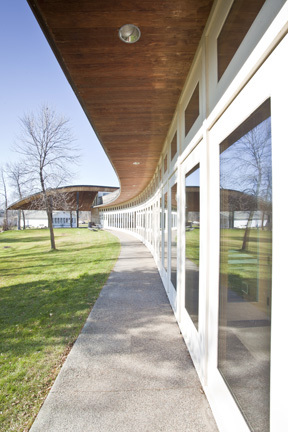 The 22,810-square-foot museum is a state-of-the-art building with cedar and maple siding, a copper roof, columns, and a wall of windows that runs parallel to the shore of Mille Lacs Lake. The outside of the building has an oak leaf motif designed by band member Batiste Sam, to represent the woodlands style of loom beading. Inside, the exhibit gallery is titled Learn About Our Past, a saying taken from the 1989 State of the Band Address given by Chairman Arthur Gahbow. In his address, Gahbow urged people to learn about the history of the Mille Lacs Band to understand issues pertaining to the environment and natural resources. The Mille Lacs Indian Museum and Trading Post is unique in that it is a state historical site located on a reservation. Visitors from all over the world come to the Mille Lacs Indian Museum to hear about the history, culture, and traditions of a proud, non-removable people who are holding onto their traditions while finding ways to be successful in the 21st century.